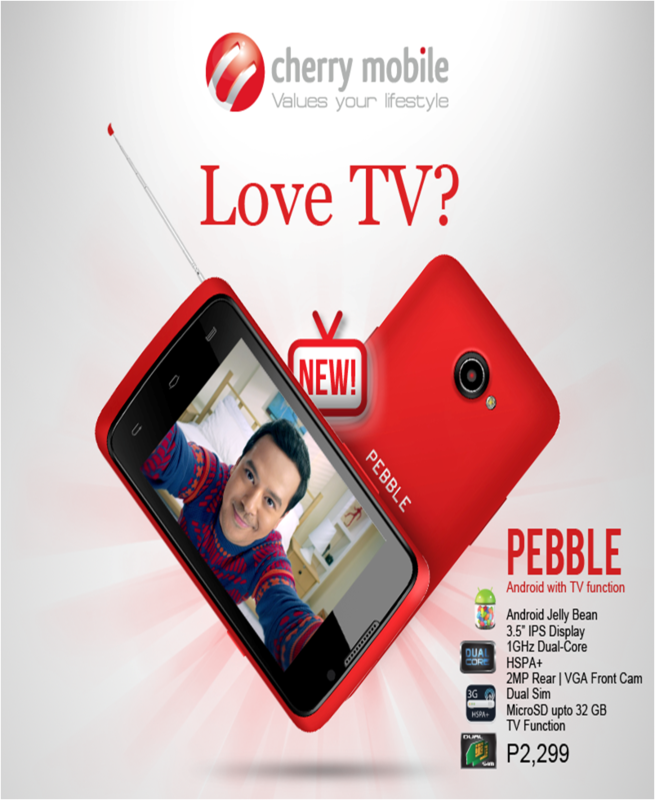 Cherry Mobile Pebble is now official which brings in a dual-core processor and dual-SIM capability for just Php 2,299. Having John Llyod Cruz on board, the local outfit introduces the familiar-sounding moniker from the smartwatch space and marketed its own ‘Pebble” smartphone for those who want to follow their favorite Free TV channels on the go. Aside from the TV feature, the Cherry Mobile Pebble also sports a 3.5-inch IPS display, 2-megapixel camera, up to 32GB of microSD support and Android Jelly Bean. There’s no mention of the RAM here but I think it would play between 256MB or 512MB. Battery and on-board memory has not been disclosed. And yes, it’s a 3G phone with HSPA+ connectivity. Check out the rest of the specs below.